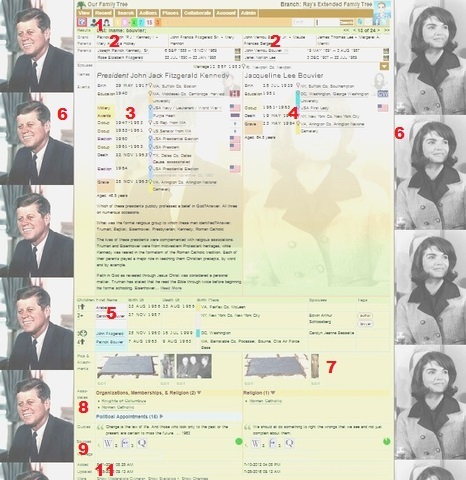 The Browse page is the central page in the site, showing the names of a couple, their dates and places, parents, children, other spouses, related documents, discussion posts, researchers, a history of changes, and sources. Below is a sample screenshot, pointing out many of the features on this page. See below to reference the numbers and descriptions. The couple shown are Thomas Jefferson and Martha Wayles. Note: If a person is not married, their information will still show on the half of the screen for their gender, with the other half blank. Two dropdown menus, one for the women, in pink, and one for the man, in blue. Each option edits, adds to, or shows more information on the corresponding person. The grandparents and parents for the current couple. Click a name or section to navigate to that couple. Everything on the left side is information about the man or husband. In the main section at the top is the person's name, dates, places, and notes. Everything on the left side is information about the woman or wife. To edit a child's record, first click it to move to that person, and then edit. To the left and right of the page is the option to show the first image for each person. If you have a large screen, this fills up the blank space provides a good view of the images, when images are attached. This can be turned on or off under Account > My Account. Below the children are listed images for each person. The Associates section lists other people who were in some way assoicated with the main couple -- friends, business colleagues, mentors, etc. The sources for each person. The "Access" section lists the moderators who manage the couple's information. Click to see more about the moderator. The dates for when the couple was added or updated. Tags for each person, each linking to a page for anyone who has that tag. At the bottom of each person is a "Custom" field where you can type any letter or number that identifies the person for later reference. For example, for someone you want research later, you might type a "R", and do a search for anyone who has a "Custom" value of "R". More on Events: Each event for each person lists the type of event (Birth, Residence, Death, Grave, Marriage), the date or approximate date, and the location. To the left of the place is a color-coded block indicating the country, state, or county. If the place has been identified on a map, a clear pin marker will show, and clicking it or the place text will link to a map showing that place. If the place has not yet been found on a map or gazetteer, a red pin will show for you if you are the moderator. If no pin shows, then either the place is not specific enough to map, or has a location has not yet been plotted. If you see the red pin, it would be good to research this place to see if the state or county or spelling is incorrect, or if it should be changed to something else. Some may be legitimate, in cases where the place has ceased to exist, but other cases may point you to data errors. If the place is correct and you would like to identify the latitude and longitude of where it is, then click the place, choose "More on this location", and there will be fields there. Enter the numbers in decimal form.